A h, Guacamole. Real, autentico Mexican Guacamole. The burst of flavor, the buttery chunks of avocado, the bite of the chiles. This is the real deal—guacamole like Tia Maria makes in her authentic Mexican cocina. Before I moved to San Miguel de Allende, I thought I knew guacamole. Recently, on a visit home, my mom served up a bowlful like I grew up with. It was mushy, pasty, creamed in the blender with sour cream, the consistency of thick mayonnaise. It was awful! A sacrilege, really, to someone who has finally learned what real, authentic Mexican guacamole is supposed to taste—and feel—like. The world can thank the Aztecs for this sublime avocado concoction. In fact, the very name comes from the Nahuatl language. Mole means concoction, and guaca comes from the Aztec name of the green alligator-skinned fruit. 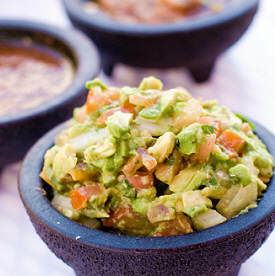 Mexicans use avocados in salads, mashed onto bread in sandwiches, sliced onto chicken or chunked into sopa de tortilla, But the best use of all is to make Mexican Guacamole. So how do you make real Mexican Guacamole? I wanted to learn to do it right, so I asked Kris Rudolph, owner of El Buen Café and La Cocina Cooking School, in San Miguel de Allende. She gave me her guacamole recipe and taught me how not to screw it up. First, she said, forget you own a blender. Guacamole should never be smooshed up to a mushy pulp. It should be chunky. If you want to be truly authentic, go to the mercado and buy a molcajete, the traditional mortar and pestle made of black volcanic stone. But you don’t really have to go that far. A bowl and the back of a heavy spoon will work. In a heavy bowl, put the finely chopped onion, cilantro, and minced serrano chile. Mash them together with the back of a heavy spoon (a wooden one works well) until they begin to form a sort of paste and the juices are mixed. Halve the avocados, discard the pit, and scoop out the flesh in big chunks with a spoon. Mix with the onion paste, mashing the avocado slightly but leaving it chunky. Don’t turn it into a mushy paste. Gently mix in the diced tomatoes, lime juice and salt. Taste. Add more salt or minced serrano to taste. Stir gently until well mixed. Now pile it high on a crispy corn chip, close your eyes, and eat it. Ahhh, real Mexican guacamole. You’ll think you’re in Tia Maria’s Mexican kitchen! * If you can’t find fresh serrano chiles in your area, you can use a jalapeno instead. The taste will be only slightly different. 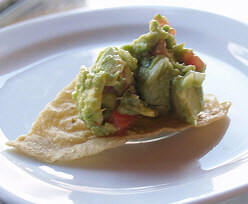 * Hass avocados tend to have better flavor for guacamole than the larger, smooth-skinned green ones. They should give just slightly to pressure but not be too soft. If you buy them at the Mexican mercado, tell the vendor you want them for hoy dia, today, or para manana, for tomorrow. She will then pick ones that have the right degree of ripeness. Never put your avocados in the refrigerator. Leave them on the counter or, if they need ripening, place them in a brown paper bag for a day or two. * Don’t try to make real Mexican guacamole in advance. Once cut and exposed to the air, avocados discolor quickly. The taste doesn’t change, but black guacamole doesn’t look too appetizing.